Eighty plus 1020 members and guests assembled at the premises of Phoenix Classic Cars at Holton Heath for a coffee start prior to the run. The weather was very cold and the tea, coffee and pastries provided by John Copleston and his family were most welcome. Members drifted off from around 11.00 am to start the 57 mile run which ended at Pamphill Parish Hall. The run passed through some of the picturesque side roads of Dorset, many of them lined with bluebells. On arrival at the Parish Hall, members were greeted by the sight of a pop up gazebo which housed a wonderfully presented hog roast. The food was superb, prepared and presented for us by John's younger son Ryan and his partner Tamzin. As you can see from the picture, the weather had warmed up enough for members to enjoy eating outside the hall in the sun. 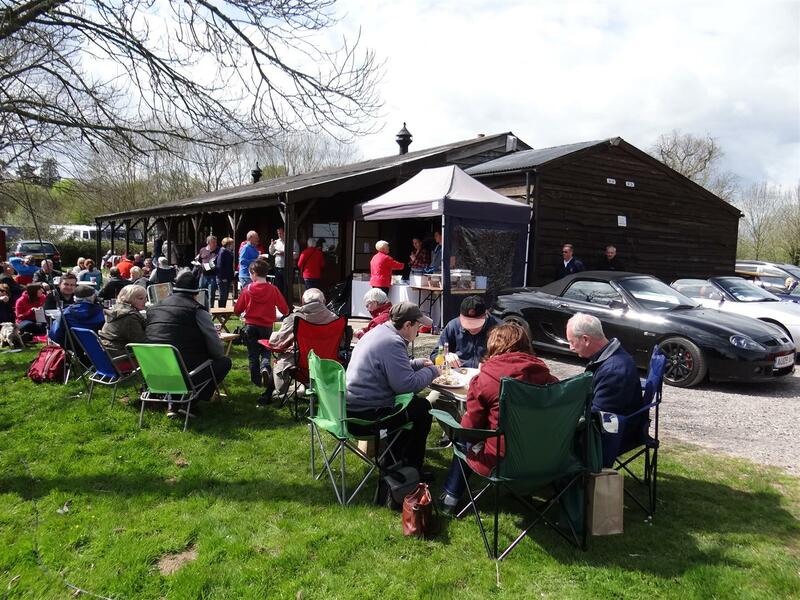 Phoenix Classic Cars provided the coffee start and the hog roast for the club as a celebration of being in business for two years since taking over from Roger Taylor. We thank John, his wife Karen and their family for their hospitality and hard work on the day and wish them continued success. We must also thank Pat Lodge, Gillian Hales and her friend Shirley for providing endless cups of tea and coffee and Tony Hales and his friend Trevor for parking cars as they arrived and Dave Bailey and George Parrott for planning another excellent route. Thank you all - without you it would not have been possible.